Most parents understand the horror that is traveling with young children on long car trips. From having to use the bathroom every five minutes, to being hungry, to boredom to wanting to be there already, life on the road with youngsters can be quite the challenge. Hunger is easy enough if you pack a few great travel snacks for the trip. The bathroom stops are unavoidable. Boredom, however? That one can be a bit more tricky. Here are five great car games to help you out. Simple and straightforward, this game is tons of fun and one that you can safely join in on as you navigate the road. Each person goes in turn to say five words towards the building of a story. Make it up as you go along and adapt as people add silly parts. Time passes quickly as you giggle at the silly ideas that come up. The classic car game is still just as effective as ever. Simply modify the rules and make them spy things in the car only. Have one person spy something of a particular color and the other folks have to guess what it is. It is called various things, but finding the alphabet on road signs, car types and license plates is a blast. Simply point them out one by one until someone finds the entire alphabet. This one is easy and educational for the young ones. Some call this game twenty questions but whatever you call it, it is a ton of laughs. One person thinks of a person, place or thing and the others get twenty yes or no questions to try to guess it. They can only ask questions that can be answered with a straight yes or no. If you are on a long road trip, try to find license plates from each of the states. Only one person can get credit for a single plate, so make sure you even out the positions in the car. If one person is sitting on the right for a bit, then switch it up equally. You won’t likely find all the states, but you simply add up the ones that are found to pick a winner. As you head out this summer to finish up any summer road trips that you have planned don’t worry about packing a ton of things for the kids to do in the car. These games can all be played with no prep work or extra packing. Doesn’t that make it nice? How do you keep the peace in the car for long car rides? 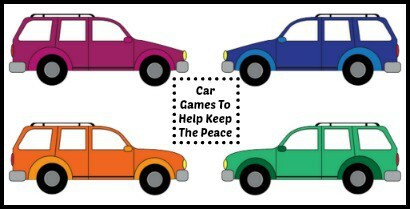 What car games does your family play? Fun ideas. Sometimes the simplest things make a trip the most enjoyable! These are great ideas! Thank you. My kids love to be busy when we travel.